I am interested in language and sensory representations across cultures. In one line of research, we seek patterns in the types of sounds languages use to mark particular meanings. Where we find patterns across languages, we work on a neurocognitive account. Are certain sounds inherently meaningful to us? How is it that sound can iconically stand for experiences in other domains and why do people agree that some sounds are better than others for representing particular meanings? I combine approaches from cognitive neuroscience, linguistics, and semiotics to examine how the senses are interconnected and how sound can trigger meaningful representations in the brain. Noemi Yoko Molitor, M. A., is a visual artist, researcher and journalist. She studied Gender Studies and European Ethnology at Humboldt University zu Berlin and Cornell University and is currently a PhD candidate at the department of Women’s, Gender and Sexuality Studies at Emory University. Molitor’s essays on lesbian and queer film have appeared in Sissy and other magazines. She also works as an art critic for the national German newspaper taz.die tageszeitung. Recently, Molitor worked as a research and curatorial assistant for the exhibition Homosexuality_ies at the German Historical Museum and the Schwules Museum*, Berlin (on view until December 1st, 2015). Her artistic practice includes abstract painting, illustration, installation and working with photographs and found objects. Tracing young queerness in memorial objects, Molitor digitally re-works childhood photographs of herself and others and builds sculptures and film-sets out of toys. Concerned with the queer relationships between artists, spectators and objects, her paintings and installations explore the im/possibility of merging with an art work or ‘becoming’ the media one works with. In her dissertation project “Queer Movements through Time and Space: Re-imagining Migration through Visual Arts”, she thus explores the autonomy of color, queer migrations through time and space and the sexuality of painting. Selected works from her series “How to Bring Yourself Up Gay” will be exhibited at the 2015 FRINGE! Queer film and arts festival in London (www.fringefilmfest.com). My ongoing project “How To Bring Yourself Up Gay” addresses queer childhoods. Children – so often used as innocent figures in need of heterosexual saving – find ways to sail around such protection. I find myself tracing how in different kinds of memorial objects such as childhood photographs and toys. For the past couple of years I have been collecting childhood pictures from the personal archives of others and myself. The images I tend to pick out, to my mind offer minute traces of early queer selves – a pink overall worn with the outmost pleasure, a lingering gaze, or merely the way a body is leaned forward. I digitally re-work these pictures, print them and then cut out details from the original images, as well as the manipulated ones with manicure scissors and layer the parts into one another. Other images, I simply submit to an exuberance of digital colors until the queer pierce a particular image elicited in me when finding it, feels most present. Recently, I started placing the works over and around childhood related backgrounds I come across in random places, such as cartoons or a grainy landscape print discarded on the sidewalk. Handling the images by hand, emphasizing details that catch my eye and bringing them in conversation with imaginary surroundings, are all ways to gaze backwards in time. The historian Annette Kuhn said that taking pictures is actually a way of remembering forward in time. Someone else took these pictures with the intention of creating particular memories. I create alternate ones. When revisiting toys I played with as a child and reading comic books I loved, I noticed the subtle and not so subtle anti-gay pedagogies at work. By putting them in extra queer constellations, I re-cite them as formative elements of a queer becoming. To me the archive that unfolds itself through my re-working of these images and objects offers traces of ‘Bringing Yourself Up Gay’ when no one else would. 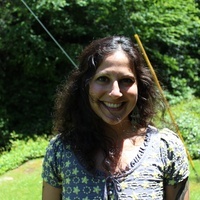 Sasha Klupchak is a PhD candidate in the Graduate Institute of the Liberal Arts at Emory University. Her dissertation: “The Ability of Observational Film: Resilience, Disability, and Documentary Film,” examines popular notions of resilience in mainstream documentary film and offers an intervention through observational film. She is a writer and working film-maker in documentary and fiction. My first film, La Mamá de los Pollitos, is published (and available for viewing) on the Journal of Video Ethnography (www.videoethno.com). Aubrey Graham is a photographer and Ph.D. candidate in Anthropology at Emory University. In the Fall of 2015, she became Emory University’s Ethics & the Arts Program first artist in residence. Her work strives to challenge stereotypical depictions of Africa within the fields of photojournalism and humanitarian photography. Since 2009 her research has employed photography as both method and theory as she explores the politics, imagination, and implications of humanitarian and local photography in North Kivu, Democratic Republic of the Congo.